In the fall of 2017, the Pratt School of Engineering debuted a new course for first-year students centered on a handson approach to the engineering design process. The course, led by Ann Saterbak, professor of the practice of biomedical engineering, and Sophia Santillan, assistant professor of the practice of mechanical engineering and materials science, aims to introduce first-year students to problem-solving and design-based engineering at the beginning of their Duke career. The class emphasizes community-based applications of engineering, something absent in most older Duke design courses. The new design course expands on the ideas of existing courses within the first-year engineering curriculum, such as the Engineering Innovation class in mechanical engineering and the Engineering the Planet class in civil and environmental engineering. 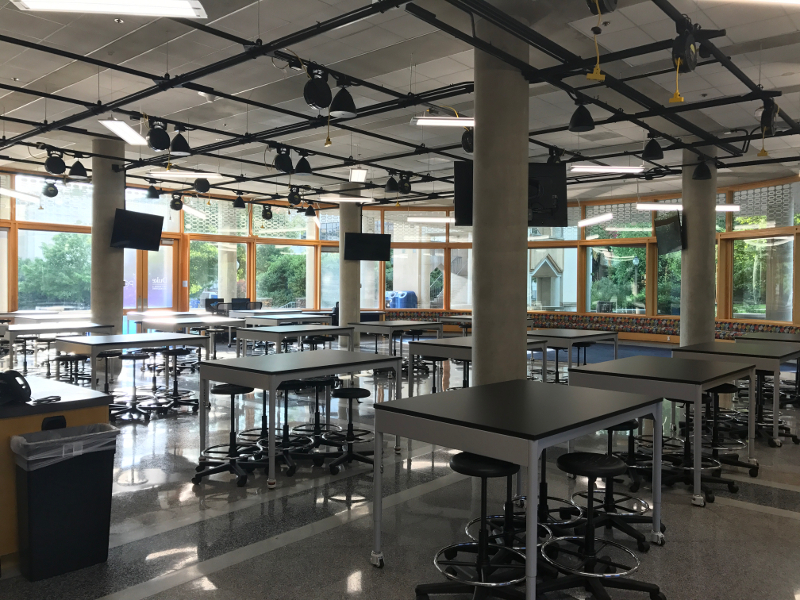 To accommodate the new course, Saterbak oversaw the conversion of The Jinny and Ed Pratt Commons in the Levine Science Research Center into a 5,000-squarefoot design space, now known as the Duke Engineering Design Pod. 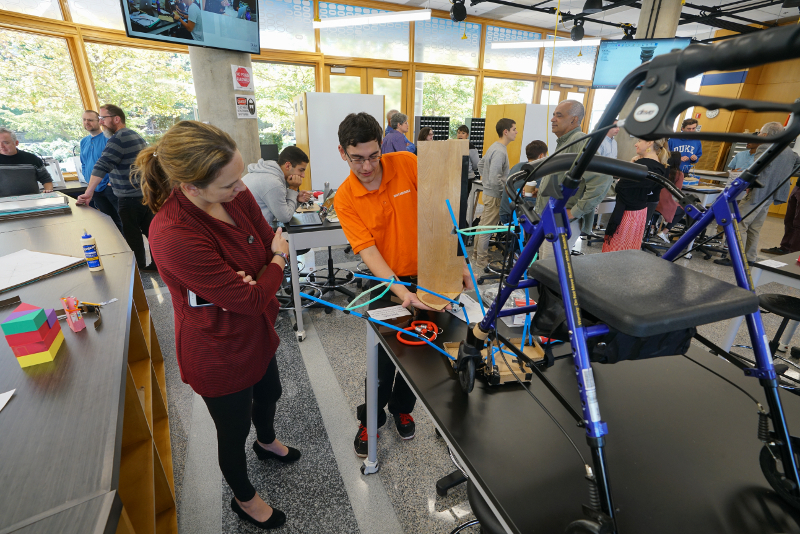 To help the course achieve its ambitious goals, the Design Pod was outfitted with workbenches, rapid prototyping machines such as laser cutters and 3-D printers, and various other power and hand tools that allow first-year students to gain knowledge about the engineering design process. With these resources at hand, students are able to quickly design, prototype, test, redesign and implement their ideas, all within the Pod. One of the things the students have enjoyed the most so far is that they are never limited by their resources. Many of the tools that are available to them are things that previous first-year students were unable to easily access. The students in the course formed semester- long project teams, working week in and week out with the same team members. The experience teaches the students a lesson about how engineering works in the real world, something that is vastly different from the lecture- and laboratory-based learning of most introductory engineering classes. Freshman Mary Gooneratne (E'21), one of the 50 first-year students in the course, said, "Learning engineering concepts through the completion of a project offers a sneak peek into what a career in engineering could actually look like, which is not only enjoyable and fun, but can be insightful for freshmen unsure if they want to pursue engineering." The new course is open to any first-year engineering student, regardless of whether they have a particular major in mind yet, allowing students to work with other students whose interests differ from their own. These interdisciplinary teams are important to Saterbak and Santillan. Other Duke faculty members have augmented the leadership of Saterbak and Santillan and have been a valuable tool for the course in its early stages. Each project team is assigned a "technical mentor"—a faculty member with expertise related to that particular project. "I'm so thankful that so many of my colleagues have volunteered their time and effort by meeting with students regularly and offering guidance and feedback," said Santillan. She believes that the students are benefitting immensely from getting to know various faculty members at Duke and gaining exposure to deeper levels of Pratt than typical first-year students. Because this is the inaugural semester of the course, Saterbak and Santillan have been careful to make note of successes and possible improvements to the curriculum and course. The end goal is to expand the course as it gains traction in the first-year engineering community. "I think that, just like for any other class, we can learn from the parts that have worked well and the parts that could go better to make the class better in future semesters," said Santillan. "Professor Saterbak and I are collecting feedback from all of the involved groups—faculty, TAs and students—to see what we can do in the next iteration of the course to make sure it's a meaningful, inspiring, and effective course!" While the engineering community's response to the new Design Pod has been positive, the introduction of the design class and Design Pod caused mixed reactions for some. The location of the Design Pod used to be home to the Blue Express Cafe. Many students were surprised to see the removal of this popular place to get food. Economics student Alex Mao (T'20) was especially sad to see the cafe go. "Professor Saterbak and I are collecting feedback from all of the involved groups—faculty, TAs and students—to see what we can do in the next iteration of the course to make sure it's a meaningful, inspiring, and effective course!" "When I got back to school and saw that Blue Express was gone, I was pretty disappointed. It was my favorite spot for lunch whenever I had class in the LSRC. The Design Pod did look really cool from what I saw though, so I'm glad to see that the space is being put to good use," said Mao. Upperclassmen engineering students were disappointed that they didn't have the same opportunity to take the class as freshmen. Mechanical engineering student Jake Morris (E'20) wished the class debuted sooner. "I took the Computational Methods course during my first semester, the one all engineering students at Duke take," said Morris. "While I enjoyed that class, I would've loved to have the opportunity to take the new class alongside it. Solving challenges for the community and implementing design-based solutions would've been a great way to gain quick engineering experience at when I first got to Duke." Overall, the new course is on the right track. Students are eager to learn about the engineering design process and have been willing to try new things and break out of their comfort zones, and Saterbak and Santillan are now looking to continue the momentum of the class in future semesters. When asked whether she would recommend the design class to future first-year students, Gooneratne responded, "I would absolutely recommend the course to other first-years! It's definitely solidified my decision to go into engineering." Ryan Kempf is a sophomore pursuing a mechanical engineering major and finance minor.